Canadian-owned gold mining outfit, Guyana Goldfields Inc., is inching close to completing its $400M project in Guyana. In fact, works are apace to have the company pour its first gold bar from their Aurora, Region Seven gold mine in June next year. On Saturday last, representatives from the media were invited to visit the Aurora site to see firsthand the progress that has been made in bringing the new mine into production. 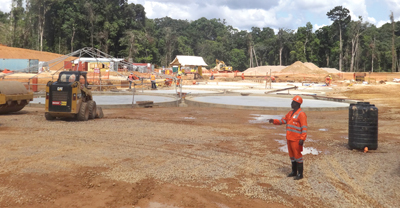 Fully funded and with 650 employees currently working on a 24 hour basis at its Region Seven (Cuyuni-Mazaruni) location, Guyana Goldfields’ Inc reports that it is on target to begin commercial production by mid 2015. The mine is now at 50 percent completion on civil engineering aspects and the Toronto-based firm prides itself in safety and good environmental practices. Guarantees were given that strict policies and guidelines are in place as they advance explorations and development of gold deposits in Guyana, by the high-spirited team which comprised of General Operations Manager, Victor Rozon; Country Manager, Violet Smith and Human Resources Manager, Peter Benny. The project, according to them, is expected to become one of the largest contributors to Guyana’s tax base and would generate up to 800 jobs during peak construction. It will also be the country’s next large scale producer, following the departure of Omai Gold Mines a few years ago. Rozon, who shepherded the session, said that although the operations would be smaller than that formerly at Omai, the mine is expected to kick off with a 5000 tonnes ore production daily with the hopes of peaking to 10,000 tonnes per day. It was also revealed that the company would be moving from open pit mining to underground mining within five years of operation of the mines; which currently has a life span of 17 years. Rozon remarked that while local miners use very insufficient measures and often lose a noticeable amount of gold in the process, the company is looking to retain a whopping 94 percent of the precious metal during their operations. Smith, in her address, told media operatives that a sum of US$249M is expected to be pumped into the construction aspect of the Aurora project to usher it into production mode. The entire package, she said, would amount to some US$400M. Aurora Gold Project has scaled back on its plans for the mines footprint from 3,000 hectares to some 800 hectares. This means that fewer trees will have to be cleared to establish the mines. The operation will grow from 650 employees with plans to recruit people from the local region and abroad. The camp has been built and expansions are ongoing to allow for a 900-man camp with fully functioning kitchen, medical center, recreation room and offices. The site itself offers a glimpse at diversity where local and international cultures meet with a mixture of Guyanese, Peruvian, Colombian, Chilean, Venezuelan and Mexican nationalities. Also, the Buckhall Wharf has been upgraded to a fully-functional river port and is used by the Company to transport equipment to the site. Rozon said that the Company complies fully with Guyanese environmental legislation and regulations. He said that it has promoted adherence to a “Cyanide Management Code” that aims to assist in the protection of human health and reduce environmental impacts through implementation of best practices for cyanide management and verification through third party audits. The Country Manager Smith also stated that adhering to environmental best practices is crafted into the loan agreement, where failure to hold fast will affect the disbursement of monies to complete construction. Questioned about the gold market, the General Operations Manager pointed out that the company is not at all worried about the falling gold prices; explaining that concern would be triggered if it falls below US$800. Meanwhile, Benny told the media that employment before the mines are opened is expected to peak at 900 employees with more Guyanese than expatriates. Guyana Goldfields Inc., which came to these shores in 1996, is expected to provide training and community development. According to Benny, what is important is that Guyanese who have never done underground mining before will get an opportunity to learn from the professionals since training is something the company places great emphasis on.